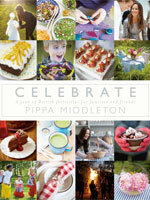 Pippa Middleton says: ‘These are irresistible to both adults and children and so easy to make. Nutella isn’t just for spreading on toast! You can also try using white or plain chocolate spread instead. Brush two Madeleine tins with melted butter. Dust with plain flour, invert the tins and tap out the excess. Place the sugar, eggs and vanilla extract in a large bowl and whisk together for at least 5 minutes or until pale, thick and able to hold a trail on the surface. Carefully sift the self-raising flour and cocoa powder over the mixture, then fold in with a large metal spoon. Pour the melted butter down the edge of the bowl and fold it in quickly and gently. Spoon 1 tablespoon of the mix into each of the Madeleine moulds. Bake for 10 minutes. Remove from the oven, transfer to a wire rack using a palette knife and leave to cool completely. To make the topping, mix together the Nutella, icing sugar and a touch of hot water to loosen the mixture slightly. Spread over the tops of the madeleines, and sprinkle over the chopped hazelnuts to serve. Tip:If you are worried about those with nut allergies, supermarkets stock nut-free chocolate spreads. Check the label for nut content. To make plain madeleines, leave out the cocoa powder from the recipe above and increase the flour to 75g. Add the finely grated zest of ½ a lemon, and bake as directed. Dust with a little icing sugar before serving. The sponges will freeze un-iced for up to 1 month.